Bollywood actress Priyanka Chopra earned worldwide recognition after entering Hollywood with the Quantico series. She then starred in a Hollywood film "Baywatch". With movies, she sizzles in all international film festivals. This has brought him tremendous popularity in social media. According to the latest update, Priyanka Chopra has reached $ 25 million on the popular Instagram photoharing app. 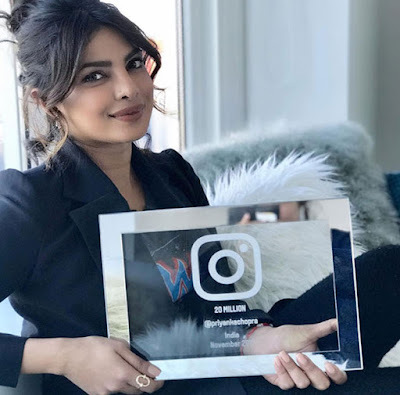 She is the most followed Indian on Instagram now. Another Bollywood beauty Deepika Padukone has 24.9 million followers and she was in second position. The Indian cricketer Virat Kohli is in third place with 22.7 million followers. On the job front, PeeCee is currently working on two Hollywood films "A Kid Like Jake" and "Is not It Romantic". She has not signed any Hindi films in the recent past but Rakesh Roshan revealed a few days ago that she was going to play in front of Hrithik in 'Krrish 4'.